Create a form that's easy for your end users to fill out. Figure out the most important data that needs to be collected, but keep it to a reasonable number of fields. End users are more likely to fill out the form if you keep it short and simple. Login as Admin and click on the Admin icon. Click on the Fields link. 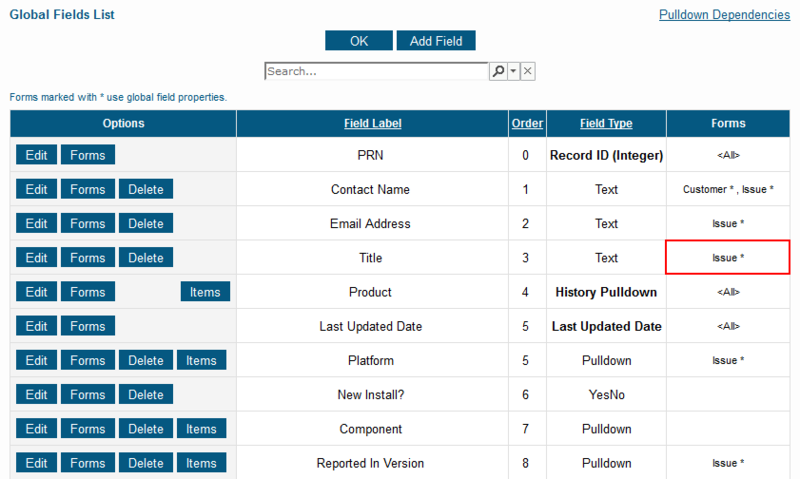 Locate the field you wish to modify and check the Forms column. 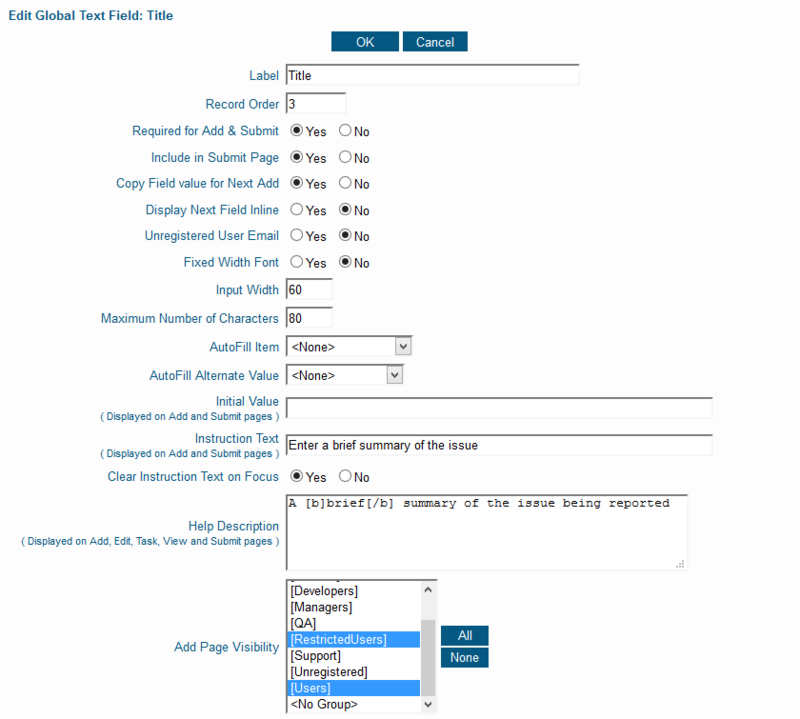 Check the name of the form where you want to change the field. 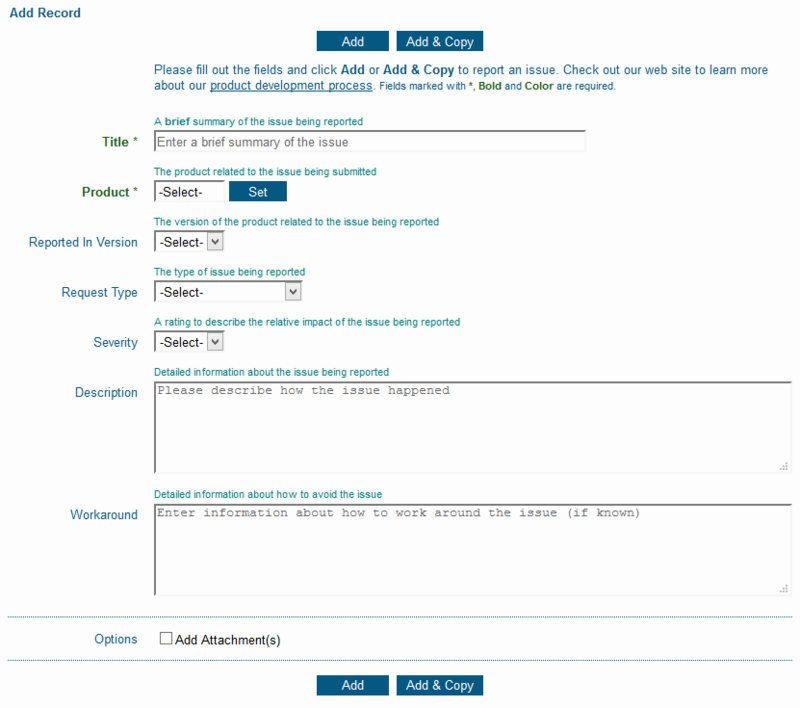 If there is a * next to the form name, click on the Edit button to the left of the field and proceed to step 5. 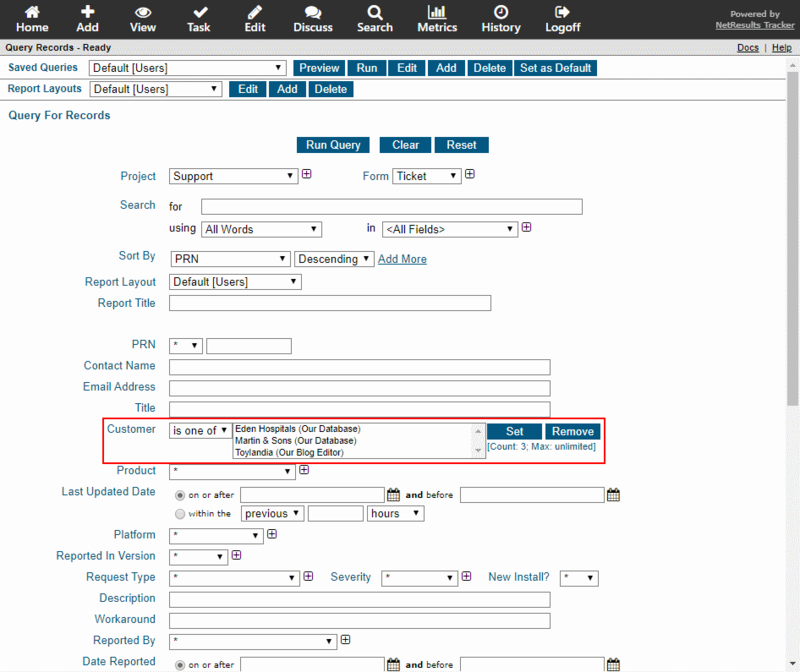 If there is no * next to the form name, click on the Forms button to the left of the field, then click on the Form name in the left column and click on the Edit button, then proceed to step 5. 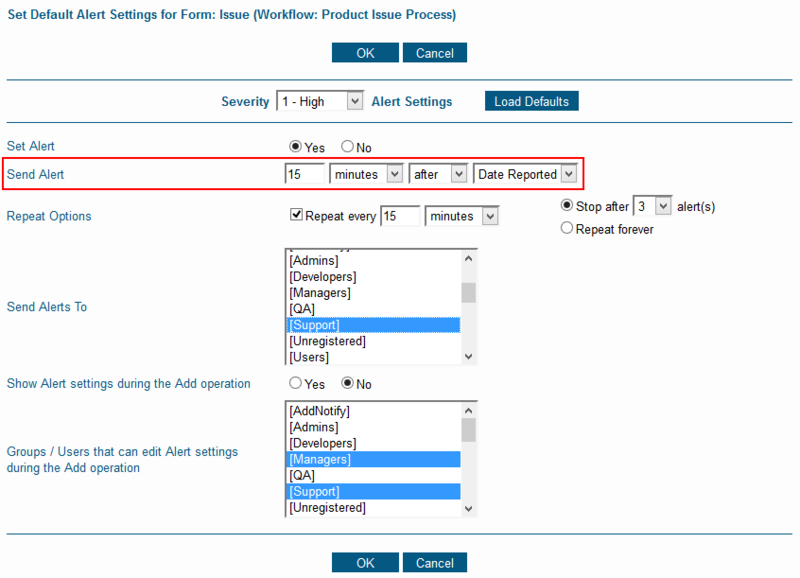 Scroll down to locate the field called Add Page Visibility. 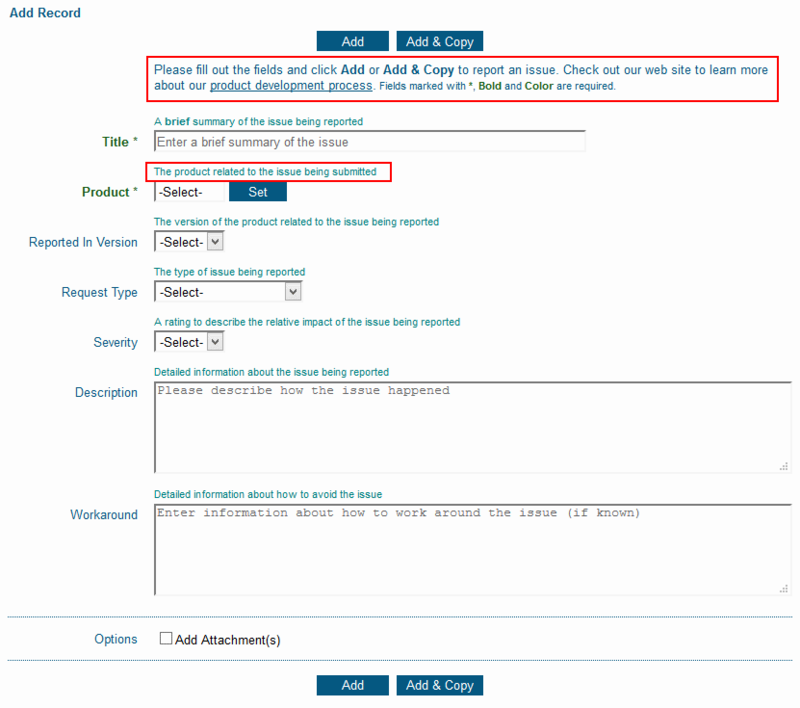 To remove the field from being displayed on the Add Page for some user groups (while keeping the field displayed for other user groups), hold down the Ctrl button on your keyboard while clicking on user groups to de-select them. List required fields at the top of the form so they get filled out first. 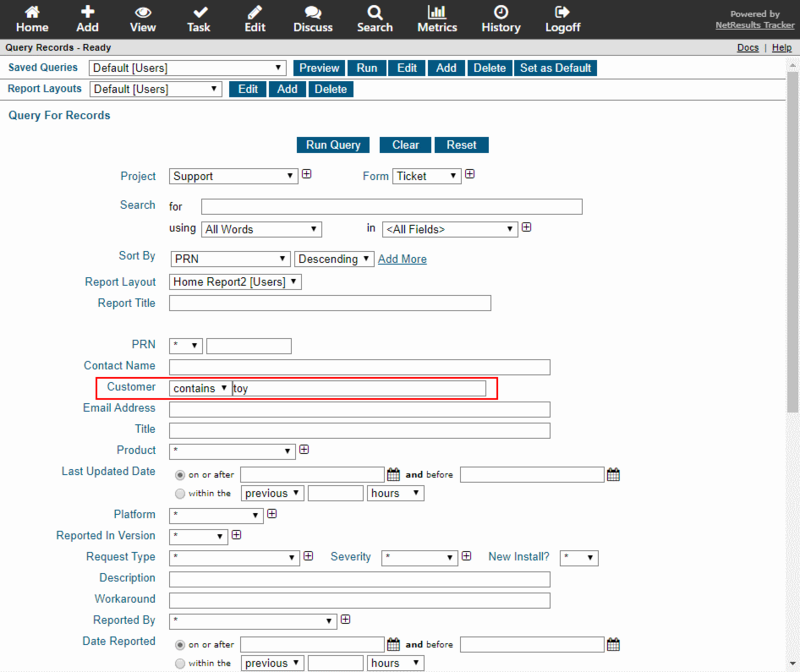 Enter a number in Record Order to determine where the field is displayed relative to other fields on the form, then click OK.
Make use of the Help Description feature to give hints about what goes into each field on the form. You can format the text using tags for bold, italics and more and you can add links to point to a web site page or document that provides additional information. Check out these posts with tips and more tips to help your end users. Show a different set of transitions in a step depending on who is processing the record. The list above shows the options available for the reporter in a product development process. The image below shows what the process manager sees when processing the same record. This is configured using Transition Visibility. 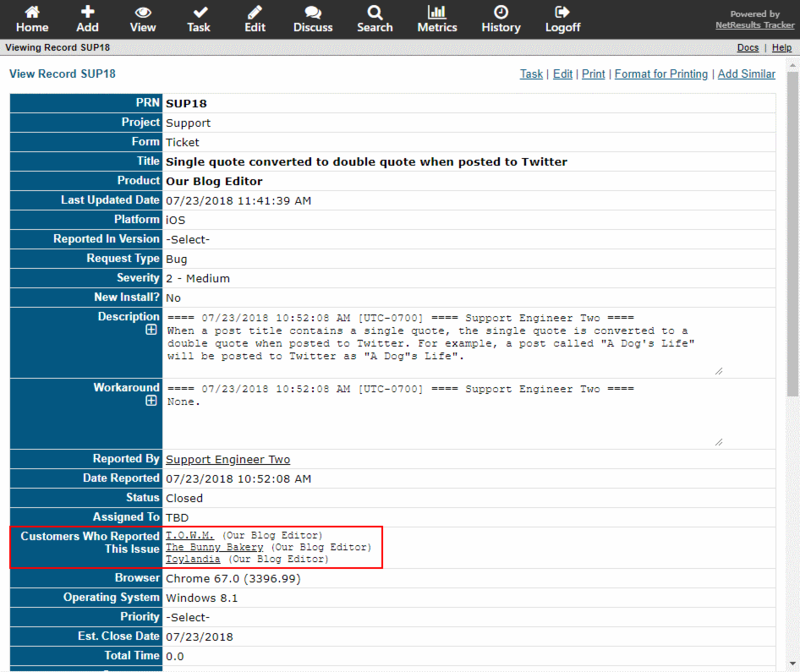 This can be set in the Make Visible to Users / User Groups option available for each transition. Click on the Workflows link. Select the workflow in the pulldown at the top. Click on the Manage link to the right of States. Click on the state that contains the transition you wish to modify, then click on the Transitions button. Click Edit to the left of the transition you wish to modify. 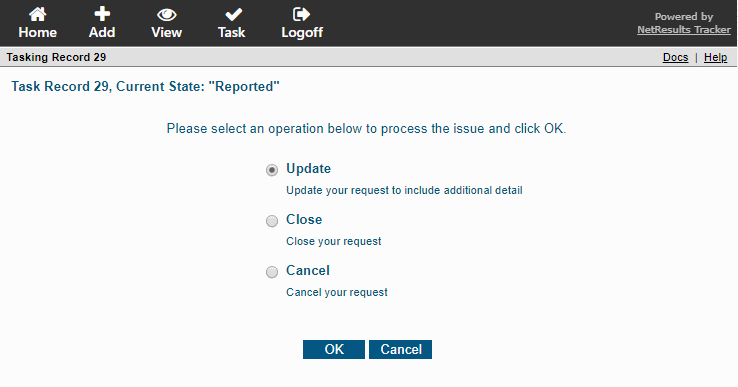 Make selections in the Make Visible to Users / User Groups option, then click OK to save the changes. Since transitions are configured with "<All Users>" selected by default, you'll need to repeat steps 6 and 7 for each transition available in that state. For more information, please review the Transition Properties section of the Online Help Guide. 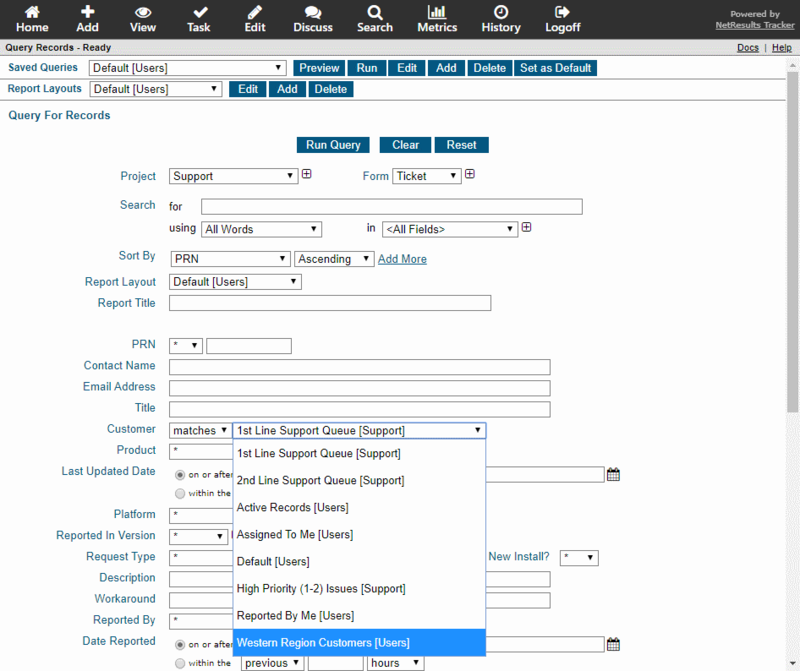 Start off with a template that has a form, fields and workflow modeled for your intended use already set up. 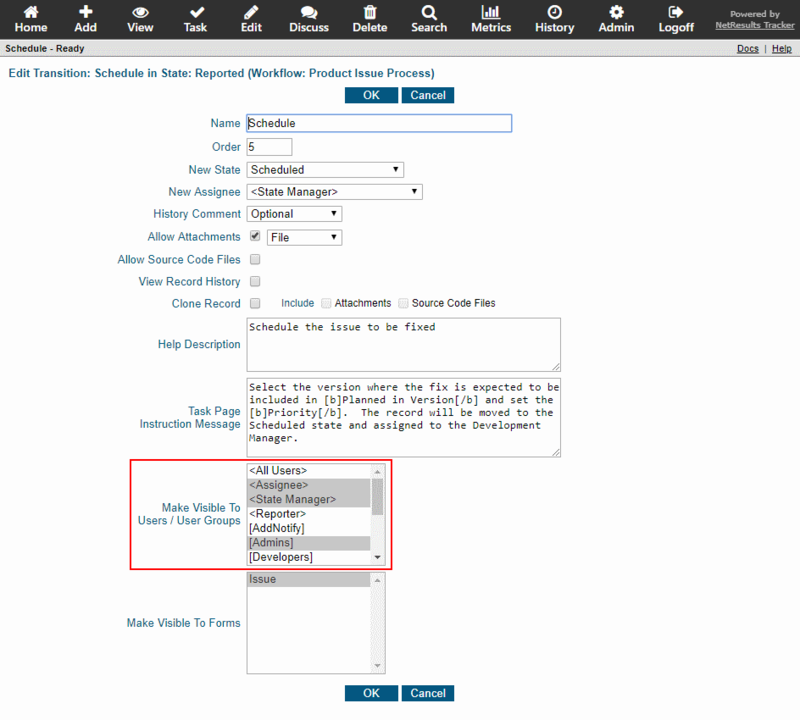 When you create a new workgroup, you can select from different templates for popular uses of Tracker such as Product Development, Support or Change Management. If none of the templates matches the process you are implementing, there is a Base template with a minimal configuration so that you can add your own fields workflow. 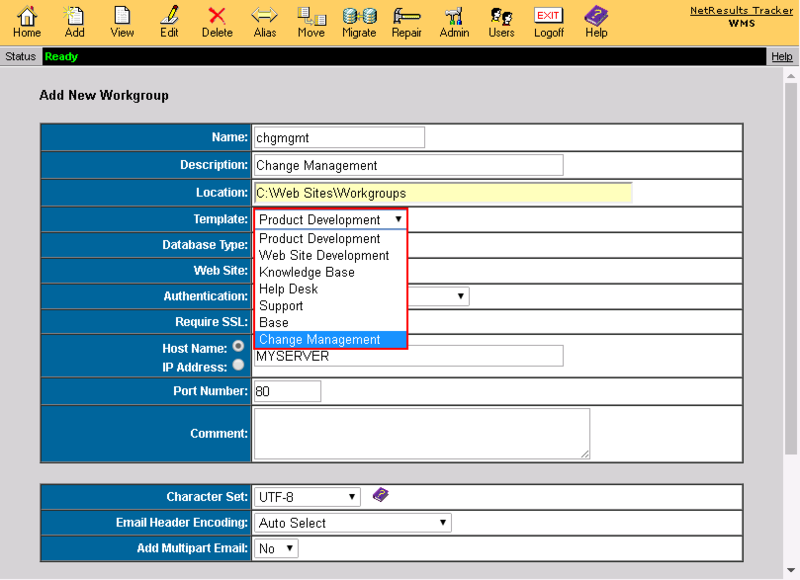 Learn about the configuration of a template by clicking on a template's link in the Online Help Guide. This blog post provides helpful information for implementing a new process or project.